Scary Monsters Magazine #103 is our It's Alive It's Alive issue! 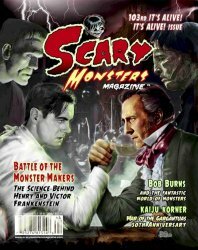 Feature articles include Battle of the Monster Makers, Bob Burns and the World of Monsters, and Kaiju Korner's 50th Anniversary of War of the Gargantuas. 144 pages of all classic horror and sci-fi! Henry or Victor? They both were scientific geniuses but from very different backgrounds. Their tragedies and triumphs were brought to movie theaters by two very different production companies -- more than two decades apart. Join us as we take an in-depth look at Colin Clive as Henry Frankenstein (from Frankenstein, 1931) and Peter Cushing as Victor Frankenstein (from Curse of Frankenstein, 1957). Which of these two cinematic creators of life was the most successful in purely scientific terms? You decide. We also have another thrilling visit with "John Agar the B-Star" in Part II of our review of his horror and sci-fi films. In addition to Monster Kid favorites like Kaiju Korner, Dr. Gangrene's Mad Interview, and Tiny Tales of Terror, we examine the films of Ray Milland, including X The Man with the X-ray Eyes! Join Sam Scare and the rest of the gang as we continue to bring horror fans like you A Real Monster Magazine -- all classic, all the time! What Would You Call Your Creation? Could the Zombo Show be Successful Today? The Journey You're About to Take is ... Weird! Scareviews: The Magic Wan & Lucy the Scream Queen? Full color cover and vintage B&W content. 144 pages plus cover. Published December 2016 by MyMovieMonsters.com. Editor in Chief: Don A. Smeraldi. Art Director: Vicki Smeraldi. Now please take a few moments and join our very own Dr. Gangrene as he previews Scary Monsters #103!